Santa Clara County Public Health Department officials on Thursday said that a 98-year-old woman with a host of chronic illnesses died of the flu earlier this month, and the overall flu fear prompted some changes in the Catholic Church. Dr. Marty Fenstersheib, Santa Clara Cunty's health officer, did not go into much detail about the woman, including naming what city she lived in. He did, however, say that some pharmacies have been running low on flu shots. At the same time, the San Jose Diocese announced on Thursday some "drastic" measures it was taking because of the flu season. Bishop Patrick J. McGrath said in an email that for as long as the flu lasts, the Diocese will only offer bread for communion, but not the wine, because parishioners have to share the same cup. He also advised that everyone use hand sanitizers before they hand out the wafers. 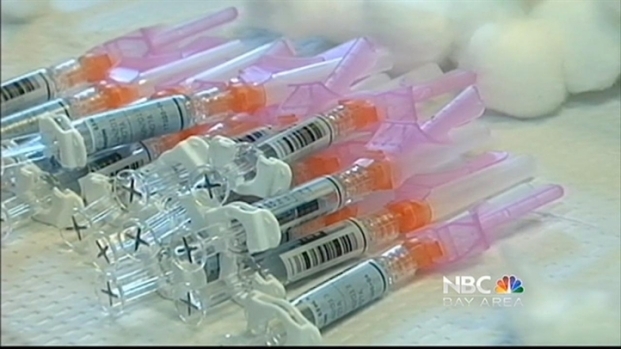 The dioceses in San Francisco and Oakland told NBC Bay Area they are leaving it up to the individual parishes to decide how to handle prayer and the flu. According to the Centers for Disease Control, 40 states are experiencing widespread flu activity. California is one of the few states reporting only regional activity but doctors warn that wont last long. NBC Bay Area's Marianne Favro reports. California only records flu-related deaths in people younger than 65. So far, this season, there are four people in that category who have died of the flu. But those numbers are misleading in terms of overall flu deaths. In San Diego County this flu season, six people have died so far of the flu who range in age from 49 to 91. This news comes on the heels of a recent report by the Centers for Disease Control showing that this unusually bad flu season has spread to 47 states, but that the outbreak may have begun to wane. "The bottom line: It's flu season," said Dr. Tom Frieden, Director of the Centers for Disease Control and Prevention during a news conference last week. "Most of the country is seeing or has seen a lot flu and this may continue for a number of weeks." Kimberly Tere reports on the Bay Area quest this weekend to find a medical facility who can give you and your family a flu shot. The report, which covers the week from Dec. 30 to Jan. 5, shows that the outbreak has now spread to 47 states, up from 41 the previous week. "We're continuing to see influenza activity remaining elevated in most of the U.S.," Frieden said. "It may be decreasing in some areas, but that's hard to predict, because particularly when you have data from over the holidays season." While 24 states are still reporting a high level of flu, that number is down from 29 the previous week. Frieden went on to say the data showing the flu could be waning may have been skewed by the holidays, a time during which doctors may be on vacation or people may be less likely to seek treatment. Since the outbreak began in October, more than 3,700 people have been hospitalized with the flu, and 20 children have died. This year's vaccine has been 62 percent effective, about what the CDC expected given current conditions, according to Frieden, who warned that even if the flu is ebbing, flu season is far from over. "Nationally, it's likely that flu will continue for several more weeks," said Frieden. "During the past decade we have seen an average of about 12 consecutive weeks — three months — of ILI (influenza-like illness) being elevated. But as we often say, the only thing predictable about flu is that it's unpredictable. Only time will tell us how long our season will last and how moderate or severe this season will be in the end." Alabama, Alaska, Arizona, Arkansas, Colorado, Connecticut, Delaware, Florida, Georgia, Kentucky, Idaho, Illinois, Indiana, Iowa, Kansas, Louisiana, Maine, Maryland, Massachusetts, Michigan, Minnesota, Missouri, Montana, Nebraska, Nevada, New Hampshire, New Jersey, New Mexico, New York, North Carolina, North Dakota, Ohio, Oklahoma, Oregon, Pennsylvania, Rhode Island, South Carolina, South Dakota, Tennessee, Texas, Utah, Vermont, Virginia, Washington, West Virginia, Wisconsin, and Wyoming.